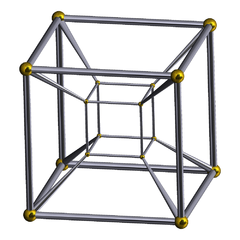 This is my favorite 2d view of a 4-dimensional cube, because it’s the most symmetrical. The 4 dimensions are depicted as going north, east, northeast and northwest. Puzzle: count the cubes in this picture. The cubes are a bit distorted, of course: they have to be because we’re squashing 4 dimensions down to 2! But they’re not very distorted. This was drawn using Robert Webb’s Stella software, perhaps by Webb himself. I like the steel rods and brass balls. Cross your eyes so the two images overlap. If you get them to lie perfectly on top of each other, they’ll lock in place and you’ll see a 4-cube in 3d. This is called a stereogram. Personally I don’t find this very helpful for understanding the 4-cube. Crossing my eyes and looking at this 3d image puts me into an altered state of mind which is fun but not good for doing mathematics! But this is probably worth a discussion all its own! So, next time I’ll talk more about rotations in 4d. The 4-dimensional cube has many names. I’ll call it the 4-cube since this is short and generalizes to higher dimensions. But it’s also called a 4-dimensional hypercube or simply a hypercube—as well as an 8-cell or regular octachoron, for some reason. When I was growing up, science fiction writers of a certain ilk called the 4-cube a tesseract. That name still persists in some quarters, though not among mathematicians. The term ‘tesseract’ has an interesting origin. It’s from a rarely used prefix tessara- meaning ‘four’ and the Ancient Greek word ἀκτίς meaning ‘ray’ (as in the element ‘actinium’). So, the term means ‘four rays’, and it comes from the fact that there are 4 edges coming out of each vertex of the tesseract. But that’s not the interesting part. What’s interesting is that is was coined in 1888 by Charles Howard Hinton, in a book called A New Era of Thought, which espoused some curious ideas about the spiritual benefits of visualizing 4-dimensional geometry. In his later book The Fourth Dimension, he developed a system of colored cubes to help people do this. A shudder ran down my spine when I read your reference to Hinton’s cubes. I nearly got hooked on them myself in the nineteen-twenties. Please believe me when I say that they are completely mind-destroying. The only person I ever met who had worked with them seriously was Francis Sedlak, a Czech neo-Hegelian Philosopher (he wrote a book called The Creation of Heaven and Earth) who lived in an Oneida-like community near Stroud, in Gloucestershire. As you must know, the technique consists essentially in the sequential visualizing of the adjoint internal faces of the poly-colored unit cubes making up the larger cube. It is not difficult to acquire considerable facility in this, but the process is one of autohypnosis and, after a while, the sequences begin to parade themselves through one’s mind of their own accord. This is pleasurable, in a way, and it was not until I went to see Sedlak in 1929 that I realized the dangers of setting up an autonomous process in one’s own brain. For the record, the way out is to establish consciously a countersystem differing from the first in that the core cube shows different colored faces, but withdrawal is slow and I wouldn’t recommend anyone to play around with the cubes at all. Hinton also wrote science fiction stories, which he called Scientific Romances. I haven’t read them, though they’re available online. In 1880 Hinton married Mary Ellen Boole, daughter of the famous logician. Her sister Alicia Boole Stott became an expert on 4-dimensional geometry, and we will meet her later in this series! But Hinton also married another woman, perhaps because his father was advocated of polygamy. He was convicted of bigamy and spent 3 days in prison for it. Not very long, but he also lost his job. • The new baseball-pitching device: Prof. Hinton of Princeon explains his invention to the alumni, New York Times, 12 March 1897. Prof. Charles Howard Hinton, who holds the chair of mathematics at Princeton University, explained last night to members of the Princeton Club of this city the baseball gun which he has invented. About 300 Princeton men were present and manifested great interest in the operation of the machine. It was actually able to throw curve-balls! I’ve read claims that Hinton later resigned from Princeton due to injuries caused by this device. However, he re-introduced the machine at the University of Minnesota, where he worked as an assistant professor until 1900. He then resigned to move to the U.S. Naval Observatory in Washington, D.C.. (Why? More injured baseball players?) Near the end of his life, he worked as an examiner of chemical patents for the United States Patent Office. He died of a cerebral hemorrhage in 1907, at the age of 54. • Mark Blacklock, Cubic thought, The Fairyland of Geometry, 10 December 2009. • Hinton’s cubes redux, Banubula, 9 November 2006. • Charles Howard Hinton, The Fourth Dimension, 1912 edition, Internet Archive. • Charles Howard Hinton, The Fourth Dimension, to which is added The Language of Space, Celephaïs Press, 2004. This entry was posted on Friday, June 21st, 2013 at 10:45 pm and is filed under mathematics. You can follow any responses to this entry through the RSS 2.0 feed. You can leave a response, or trackback from your own site. No credits for the graphics? Whoops! I forgot. I’ve added comments saying who drew what, except for the first one—I don’t know who drew that. And if you click on the pictures, you’ll usually get taken to more information about them. Great to hear from you—it’s been a while! Academic genealogy trivia: Charles Hinton was also an ancestor of Geoff Hinton, neural networks researcher. Great post! As to your puzzle question, I counted 8 cubes in total in the first picture presented. I drew out the 4D-cube and labeled the vertices with letters and enumerated them and initially got 10, but then I realized that I repeated a cube twice more, so i ended up with 8 cubes total. I’m glad you enjoyed this one… I got pulled into reading and writing a bit about the mysterious Hinton. I just saw your harmonograph. It’s beautiful! Thank you John – I am still laboring with it in the metal workshop! I know that there is a mathematical formula for the pendulum frequencies, but as a non-mathematician it still defeats me – have you written about this anywhere? Thank you John – I am still laboring with it in the metal workshop! I know that there is a mathematical formula for the pendulum frequencies, but as a non-mathematician it still defeats me – have you written about this anywhere? Here is the period of the pendulum, is its length, and is the acceleration of gravity, about 9.807 meters/second2. However, if the pendulum swings high, its period becomes longer, as you can easily see if you imagine it swinging very high, like a child trying to swing all the way over the swing set. We need a more complicated formula to describe this. The exact formula involves elliptic integrals, and I’ve written about that… but if your pendulum doesn’t swing too high, you may be content with this formula: not the first one, but the one with correction terms involving which is the maximum angle from vertical that the pendulum swings. I suspect that your harmonograph will be more complicated. It’s not just swinging back and forth in one direction: it may be a true ‘spherical pendulum’, or maybe something even more complicated. But if it doesn’t swing too high, its period should still be given approximately by the simple formula I wrote down. Why do you want to know the pendulum’s frequency? Thanks John – very detailed, as I would expect from you! One of the pendulums is rotational (so I guess elliptical, as the gimbal is hand-made and so will not be exactly accurate). I want to know the pendulum’s frequency, because I understand that there is a relationship with sound frequencies, and apparently the harmonograph can be set to mimic the frequencies of different musical intervals – see “Harmonograph: A visual guide to the mathematics of music” by Anthony Ashton, Wooden Books. Tha gadget above is a scale model of the harmonograph. There are three pendulums – two lateral and one rotational, each one mounted through the center of the three discs on the table top. 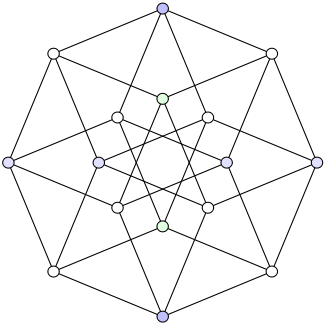 I couldn’t face trying to count the cubes, but there’s a short-cut: with the square being bounded by four 1-cubes (aka lines), the cube by six squares, the four-cube must be bounded by eight three-cubes. In the cube-within-cube visualization, six of these are the distorted hexahedra between a big face and a little one, one is the inner cube, and one is the rest of the universe. 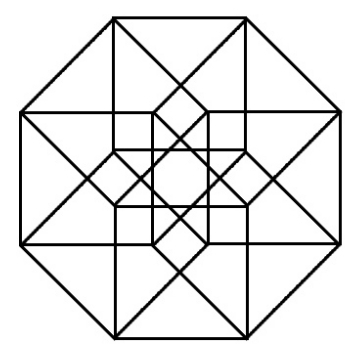 if you note that each edge of the octagon touches two cubes having a square face touching that edge, but each cube has two square faces touching the octagon. So, the answer is 8 × 2 / 2 = 8. But a somewhat better way is to note that if you have a n-dimensional cube lined up with the coordinate axes, for each of the n coordinates there’s a face on which that coordinate takes its maximum value, and one where it takes its minimum value. So, you get 2n faces. Hinton’s cubes and the accompanying letter by a Mr. H. Barton remind me of the curious J.L. Borges story ‘The Zahir’. Jorge Luis Borges was a fan of Hinton’s higher space writing, so much so that he included the first collection of Scientific Romances in The Library of Babel (or ‘La Biblioteca di Babele’) produced with Italian art-book publisher Franco Maria Ricci in the 1970s (French interview with the publisher here). It’s a beautiful looking series of 33 titles, including Henry James, Arthur Machen, Poe, Wells etc. (full list here) and was republished in French by the recently defunct Panama editions in 2006. Seems Hinton did have an influence on Borges’ writing. I’ll have to re-read Tlon, Uqbar, Orbis Tertius! This is a sequence of sections of a tesseract, going along a diagonal between opposite vertices. Which bears a striking resemblance to the tetrahedron family from Part 7 of this series. which appears to be the octahedron through cuboctahedron of the cube family from Part 5. Cool! In this kind of math, I think you can safely assume these patterns aren’t coincidences. The whole idea of a coincidence in mathematics is a bit tricky, since presumably the whole structure is deterministic… but what I mean is, it will pay to ponder these relationships: they’ll lead to something good. The tesseract entered popular culture through Madeleine L’Engle’s “A Wrinkle in Time”, though L’Engle caused some of her readers confusion when one of the characters in “A Wrinkle in Time”, the prodigy Charles Wallace Murray, declared “Well, the fifth dimension’s a tesseract.” L’Engle wasn’t sure how to reconcile Hinton’s ideas about the fourth dimension with Einstein’s, so she put Hinton’s fourth dimension after Einstein’s, demoting it from fourth place to fifth.